This is a set only Indy F1 McLaren Honda "Tyco" #2. 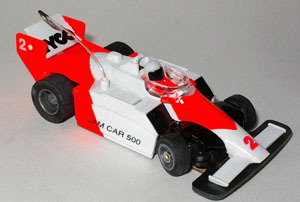 Both cars in the set have "JAM CAR 500" on the sides. It is new never used and comes on a narrow Tyco TCR chassis. This is a Indy F1 Lotus Honda "Canon" #5. It is new never used and comes on a narrow Tyco TCR chassis.